Instead, it’s a unique combination of greens, superfoods, adaptogens, herbs, and other phytonutrients that are proven to increase immunity, heart and circulatory health, energy levels, libido, mood, and more. For example, it contains clinically effective doses of spirulina, reishi mushroom, moringa, and maca, as well as several other supplements that confer a variety of desirable health and performance effects but aren’t exactly easy to work into your diet without supplementation. 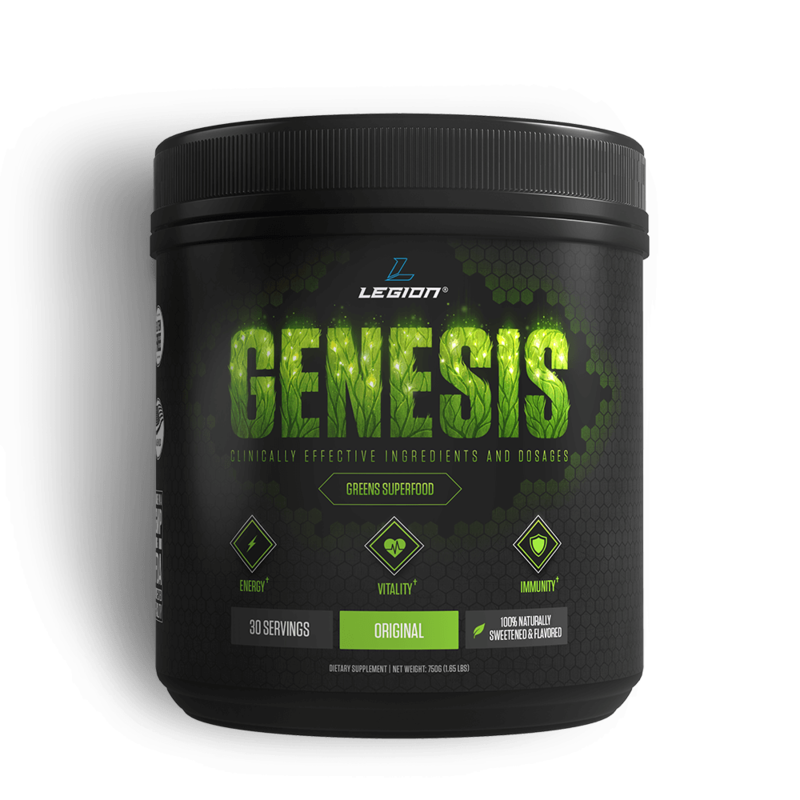 GENESIS is also naturally sweetened and flavored and contains no artificial food dyes, fillers, or other unnecessary junk. All that is why it has over 220 reviews from customers on Amazon.com with a 4-star average, and another 180+ on our websites, with a 4.5-star average. What GENESIS is not, though, is cheap, so if you’re concerned about the price, I understand--you can get a greens supplement for a bit less. Remember that you get what you pay for, though, so generally speaking, the cheaper a supplement is, the less effective the formulation. Place your order now and if you don’t absolutely love GENESIS, just let us know and we’ll give you a full refund on the spot. No complicated forms and no return necessary. You really can’t lose, so order now and get ready to feel healthier, recover better, and increase your immunity and longevity. As you know, people who eat several servings of fruit and vegetables live longer, healthier lives than those who don’t. Some people ensure they eat enough of these foods every day, but many people find supplementation helpful in meeting their daily needs. This is why we started with a greens blend consisting of three plants: spinach, kale, and dandelion leaf. The clinically effective dosage of reishi mushroom extract ranges between 1.5 and 5 grams. Spirulina is a blue-green algae that is widely considered one of nature’s richest and most complete sources of vital nutrients. It’s often used as a vegan source of protein and is particularly rich in B vitamins, minerals, and essential fatty acids. It also contains a notable amount of phycocyanobilin, which is a molecule that provides potent anti-oxidative and anti-inflammatory effects. Phycocyanobilin accomplishes this by stimulating immune cells, and, rather uniquely, spirulina contains another compound known as a Braun lipoprotein that prevents the immune system from overreacting and creating widespread inflammation. The clinically effective dosage of spirulina ranges between 2 and 10 grams. Astragalus contains a variety of beneficial molecules such as flavanoids and polysaccharides, but one of the more notable components is astragaloside IV, which is a type of compound found in many plants known as saponins. For centuries, the natives of Northern India have known the many benefits of the moringa tree. Virtually every part is useful, and it grows quickly, can survive droughts, is highly nutritious, and can even help produce clean water. The leaves have long been a part of India’s medicinal traditions, and research confirms just how extraordinary their nutrient profile really is. Gram for gram, Moringa leaves contain four times the calcium and two times the protein of milk, three times the potassium in bananas, four times the vitamin A in carrots, and seven times the vitamin C in oranges. The clinically effective dosage of moringa ranges between 500 and 2,000 milligrams of the leaf. Maca is a plant native to Peru that’s grown for its fleshy root, and its cultivation goes back thousands of years, as it was an integral part of the diet and commerce of the ancient Incan civilization. Historically, maca has been used as an energy and libido enhancer and for improving hormonal function. Knowledge of its special properties all but disappeared, but, thanks to German and North American scientists studying the “lost crops of the Andes,” maca was introduced to the world in the 1960s and again in the 1980s. The clinically effective dosage of maca extract ranges between 1 and 3 grams. The clinically effective dosage of broccoli sprout depends on how much sulforaphane it provides, and the clinically effective dosage of sulforaphane is 1 to 9 milligrams. Mix 1 serving with 10-12 oz of cold water, or your favorite beverage. Use first thing in the morning as a great way to jump start your day! Consult your physician prior to consumption if you have any pre-existing medical conditions, or if you are taking any prescription medication(s). Not recommended for individuals taking anti-coagulant or blood pressure medicines. 04. Mortality in Randomized Trials of Antioxidant Supplements for Primary and Secondary Prevention Systematic Review and Meta-Analysis,” JAMA 297, no. 8 (2007): 842–57. doi: 10.1001/jama.297.8.842. 25. Probiotic Use in Clinical Practice: What Are the Risks? 83. Broccoli sprouts: an exceptionally rich source of inducers of enzymes that protect against chemical carcinogens. 84. A major inducer of anticarcinogenic protective enzymes from broccoli: isolation and elucidation of structure. 85. A novel mechanism of chemoprotection by sulforaphane: inhibition of histone deacetylase. 86. Fueling the obesity epidemic? Artificially sweetened beverage use and long-term weight gain. 87. Artificial sweetener use among children: epidemiology, recommendations, metabolic outcomes, and future directions. 88. Gain weight by “going diet?” Artificial sweeteners and the neurobiology of sugar cravings. 89. Steviol glycosides from Stevia: biosynthesis pathway review and their application in foods and medicine. 90. Antioxidant, anti-diabetic and renal protective properties of Stevia rebaudiana. 91. Safety evaluation of certain food additives. 92. Effects of Stevia rebaudiana (Bertoni) extract and N-nitro-L-arginine on renal function and ultrastructure of kidney cells in experimental type 2 Diabetes. 93. Toxicological significance of azo dye metabolism by human intestinal microbiota. 94. Effects of tartrazine on exploratory behavior in a three-generation toxicity study in mice. 95. Artificial food dyes and attention deficit hyperactivity disorder. 96. Meta-analysis of attention-deficit/hyperactivity disorder or attention-deficit/hyperactivity disorder symptoms, restriction diet, and synthetic food color additives. 97. Food additives and hyperactive behaviour in 3-year-old and 8/9-year-old children in the community: a randomised, double-blinded, placebo-controlled trial. 98. Prolonged use of the food dye tartrazine (FD&C yellow no 5) and its effects on the gastric mucosa of Wistar rats. 99. Effect of food azo dye tartrazine on learning and memory functions in mice and rats, and the possible mechanisms involved. 100. Effect of food azo dyes tartrazine and carmoisine on biochemical parameters related to renal, hepatic function and oxidative stress biomarkers in young male rats. 101. Physiological effects of some synthetic food colouring additives on rats. 102. New considerations regarding the risk assessment on Tartrazine An update toxicological assessment, intolerance reactions and maximum theoretical daily intake in France.